Rhizocarpon obscuratum (Ach.) A. Massal. 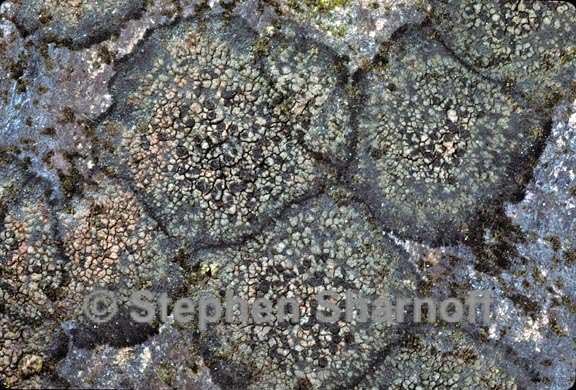 Life habit: lichenized, not lichenicolous Thallus: crustose, warty-rimose to areolate, up to 10 cm in diam. ; prothallus: usually distinct, black, sometimes fimbriate areoles: 0.2-0.5(-1) mm in diam., flat to weakly or highly convex, dull, angular to +round surface: brown-gray to gray, dark gray or dark brown, or sometimes white Apothecia: not much projecting above thallus, round, Lecidea like, 0.2-0.6(-1) mm in diam. disc: often +umbonate and roughened, mostly flat, rarely convex, epruinose or rarely +ochraceous pruinose margin: black or appearing pseudolecanorine, thick and persistent or more often thin or disappearing exciple: K-, without crystals epihymenium: red-brown or olivaceous, K-, without crystals hymenium: hyaline, 70-130 µm tall ascospores: hyaline initially but becoming brown, with few to moderately numerous cells, with 3-4 transverse septa and 1 longitudinal septum, 2033(-36) x 9-16 µm Spot tests: medulla I-; thallus K+ yellow or red, C-, KC-, P+ yellow or orange or P- Secondary metabolites: stictic or norstictic acids, or none detected. Substrate and ecology: on smooth, dry, siliceous rocks. World distribution: Europe, North America (mostly northern and eastern), South America and Africa Sonoran distribution: Arizona and Chihuahua. Notes: Rhizocarpon obscuratum is a variable species. 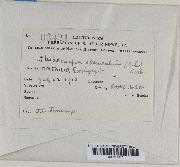 One specimen was previously reported as R. oederi (Weber) Körb.